The night they made October plans. Anibal Sanchez (24 GS, 151.1 IP, 2.68 ERA, 2.50 FIP, 5.0 WAR) put a messy first inning behind him nicely and despite allowing 3 runs over 6.2 innings, was quite good and rarely in any sort of trouble while striking out five and walking one. The Tigers got their runs in bunches, mostly thanks to two big homeruns from Infante who delivered a 3 run shot in the 2nd and a 2 run bomb in the 6th. Things got close and dangerous in the 8th when Carlos Santana launched a fly ball to deep center that Jackson nearly caught, but couldn’t as he crashed into the wall. Santana would wind up scoring on the play as Jackson was hurt – though thankfully stayed in the game and broke it back open in the bottom half with a 2 run triple as part of a 4 run inning. The win is the Tigers 80th as they push their division lead to a near ironclad 8.5 games entering the season’s final month. The ball will go to Justin Verlander (28 GS, 178.2 IP, 3.73 ERA, 3.54 FIP, 3.7 WAR) on Sunday who will look to give the Tigers a 16-3 record against the Indians in 2013. Also of note, will be the arrival of top prospect Nick Castellanos. With the final three games of the season against the Indians taking place this weekend, the Tigers turned to Rick Porcello (25 GS, 148 IP, 4.44 ERA, 3.51 FIP, 2.6 WAR) to get off on the right foot and the 24 year old hurler did just that, tossing 5.2 innings of 2 run baseball as his team staked him to an early lead. The Tigers grabbed one in the second and four in the third in part due to a hilarious Michael Bourn misplay in centerfield. Porcello got ground ball after ground ball and the bullpen backed him up to send the Tigers to 7.5 games up in the division with just 27 games to play. One more win this weekend should finalize the team’s October plans and Anibal Sanchez (27 GS, 144.2 IP, 2.61 ERA, 2.43 FIP, 4.8 WAR) will try to set the team up to do just that on Saturday. 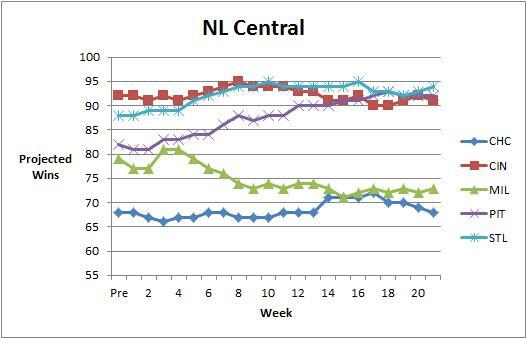 During the middle part of the season, much was made over the Tigers inability to score runs late in games. I don’t have the exact numbers, but they scored many fewer runs in the 7-9th innings than they did during the earlier ones. A lot of people were concerned that the Tigers weren’t clutch, or for some reason gave away innings at the end of the game. At the time, my view was pretty much in line with most of my views on statistics. The overall number was more important than the split. At the time, the Tigers were a top five offense in terms of run scoring and in terms of other stats like wOBA and wRC+. 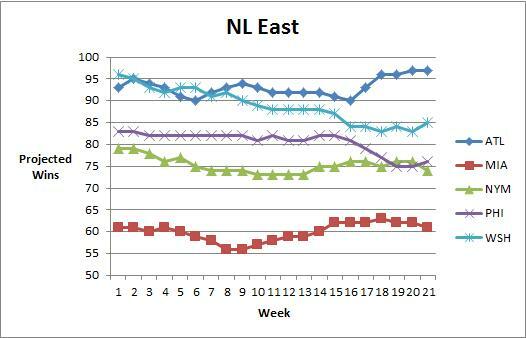 Or even basic numbers like OBP and OPS. 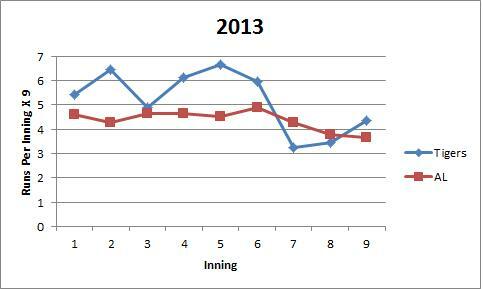 The Tigers were a good offensive and the inning to inning variation didn’t seem meaningful to me. Now that we have some more data, let’s take a look. 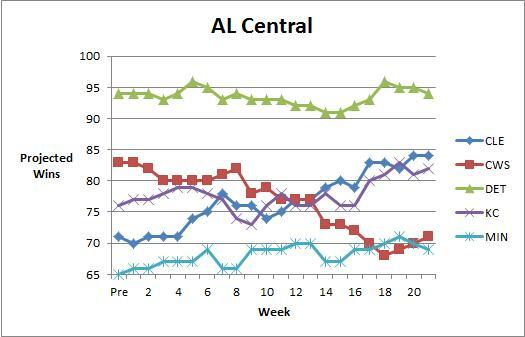 Below are the Tigers runs per inning compared to the league average AL club. 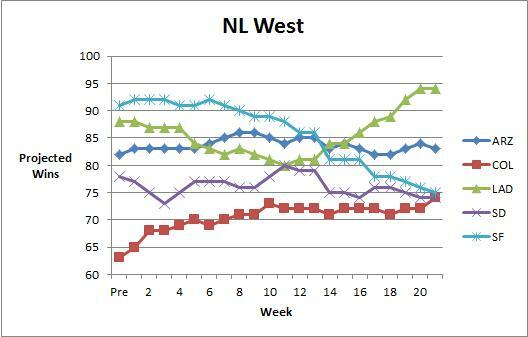 You’ll notice I’ve multiplied the runs per innings times nine so that you can more easily interpret the numbers. Entering August 30th, the Tigers have scored 5.2 runs per game and have five innings above that pace and four innings below. 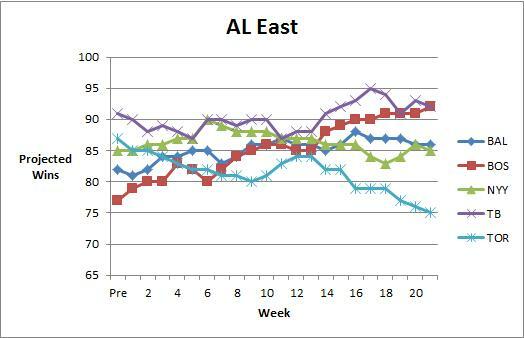 The entire AL scores 4.4 runs per game and has a four/five split above and below. Several things jump out. First, it appears to be very common for teams to score fewer runs in the final three innings. Relievers allow fewer runs per inning because they don’t have to pace themselves like starters – this is well established. 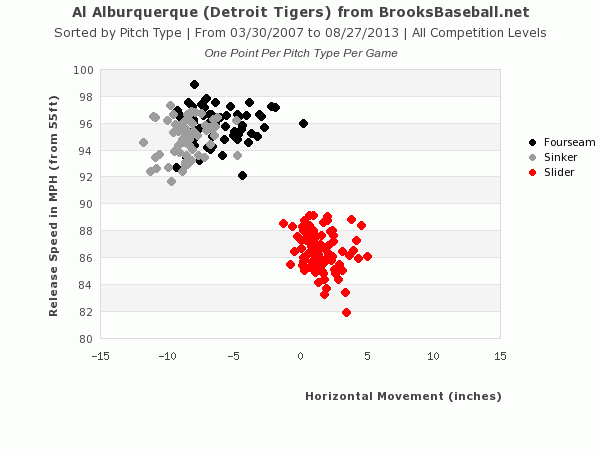 Second, you’ll notice that the Tigers outperform league average in 7 of 9 innings. Third, you’ll notice the 7th inning is the only inning in which they seriously under-perform. But I’d like to call your attention to the 3rd inning. 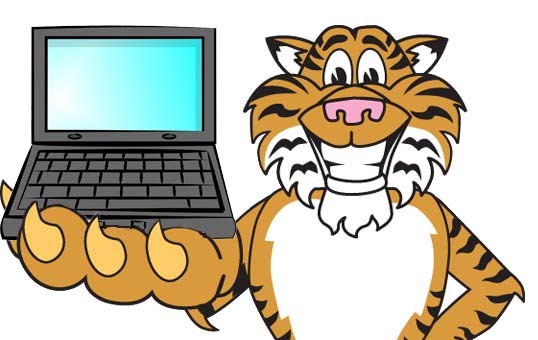 The Tigers have a drop off in production between innings 2 and 4 that otherwise goes unexplained. What is it about the 3rd inning that causes this? Nothing. That’s silly. Let’s now look at the percentage of innings in which the team scores – in other words controlling for the big innings. How often do they score? This graphic tells the same story. The Tigers score frequently and they score a lot, with both a little lighter on the back end. What does it all mean? First of all, they’ve improved in the late innings lately and limited some of the early season damage. In big enough samples, things tend to balance out. Second, runs scored are runs scored. They count the same in the first and the eighth, so what does it really matter? They are outscoring their opponents by quite a bit. Does scoring less often in a certain inning reflect a real difference in ability? I can’t see how it would. What accounts for the difference between the 3rd and 4th innings? What about the the 6th and 7th? Their performance goes up and down, so it’s not attrition. They score better than average in the 9th, so it’s not like they wilt under pressure, because the 9th should have the most pressure because you’re running out of outs. I don’t really have a good explanation, but I’m not sure we need one. The Tigers score a ton of runs and the distribution is balancing out to some degree. I really just wanted to put the numbers out there and let you make up your own mind. I don’t think the distribution is meaningful, but you might. Throw out some ideas in the comments section if you’re so inclined. They’re comfortably baseball’s best offense, must they also be the most even keeled one? Max Scherzer (27 GS, 183.1 IP, 2.90 ERA, 2.73 FIP, 5.5 WAR) entered the day likely driving the Cy Young bus, but stubbed his toe against the red hot A’s, allowing 6 runs (5 ER) in 5 innings courtesy of 2 HR. He struck out 5 and walked only 1, but much of the contact was sharp. He wasn’t atrocious by any means, but compared to the rest of his season, it’s hard to remember a day in which he was tagged any harder. The Tigers clawed at the sides of the early hole as they got a run in the 4th and 2 in the 6th, but entered the 9th inning down 6-3 with Balfour coming on. Jackson walked, Dirks popped out, and Avila struck out before a Fielder walk and Martinez single prepared Torii Hunter to come to the plate. After entering as pinch hitter earlier in the came, Hunter was hitting in the 6 spot, but that didn’t seem to matter as he drove the second pitch he saw out to left to win it for the Tigers. The win helps them avoid the sweep and guarantee they welcome the Indians to town no closer than 5.5 games back with Rick Porcello (24 GS, 142.1 IP, 4.49 ERA, 3.53 FIP, 2.5 WAR) taking the ball in the first game. The Moment: Hunter walks off down 2, with 2 outs. Let’s get a few things out of the way early. 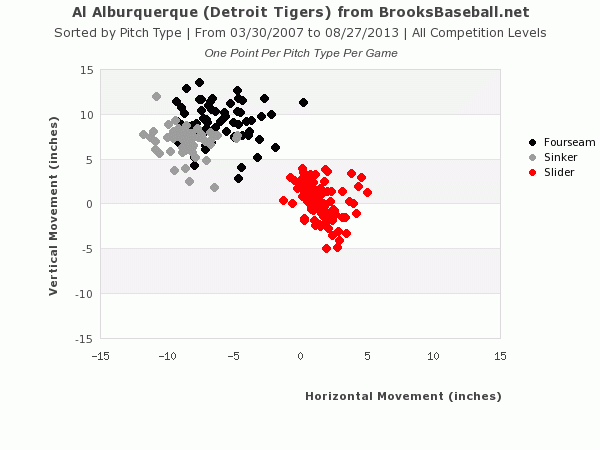 Al Alburquerque gets a lot of strikeouts and issues a lot of walks. 33.7% of the batters he has faced in his career have struck out. 16.1% have walked. Add those together and we’re talking about 49.8% of his career has been spent not letting the hitter put the ball in play. It should also be noted that his arm should probably fall off given that pitching with good mechanics is very violent and he doesn’t have good mechanics. Al-Al (as I’ll refer to him because his last name takes forever to type) is really good at not allowing batters to make contact and when they do, it’s not usually great contact. In his career, he’s allowed a .291 SLG (MLB average is about .400). In 95.1 IP, he has a 2.93 ERA, 2.71 FIP, and 1.9 WAR. He’s been erratic, but he’s been very effective – and that includes slightly elevated 2013 numbers based on an out of the ordinary BABIP. He’s not likely to produce a .220 BABIP like he did in 2012, but .350 is likely too high as well. All in all, Al-Al is a dangerously talented all or nothing kind of arm. He might throw 10 straight balls or he might retire six batters like nothing. You know this about him and you know that he’s got a two pitch mix. Fastball, slider. That’s it. The fastball is good when he can command it, but his moneymaker is his slider. This post is about that slider for no other reason than it is incredible. Since he only has 95.1 career innings, I’m going to stick with career long stats entering play on August 28th. Coming in, Pitch F/X says he’s thrown 974 sliders (about 60% of his pitches) and has allowed a .130/.226/.148 line against, good for a .186 wOBA and 20 wRC+. Those are insane numbers. Against Al-Al’s slider, hitters are 80% worse than league average. They slug 100 points lower than league average batting average. It’s incredible. He gets a 24% swinging strike rate against it. League average in 2013 is 9.2%. He gets a 47.9% Contact%. League average is 79.7%. Among pitchers to throw 600+ sliders in the Pitch F/X era, no one has a higher Whiff/Swing rate on that pitch than Al-Al’s 54%. It’s nasty. When batters hit it, it rarely does much. And they don’t hit it very often. What are you supposed to do with that? 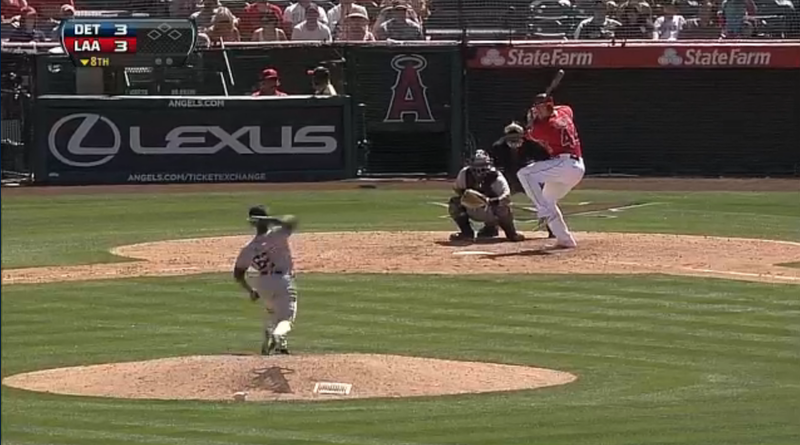 By that point in his delivery, Verlander has the ball way out in the open. 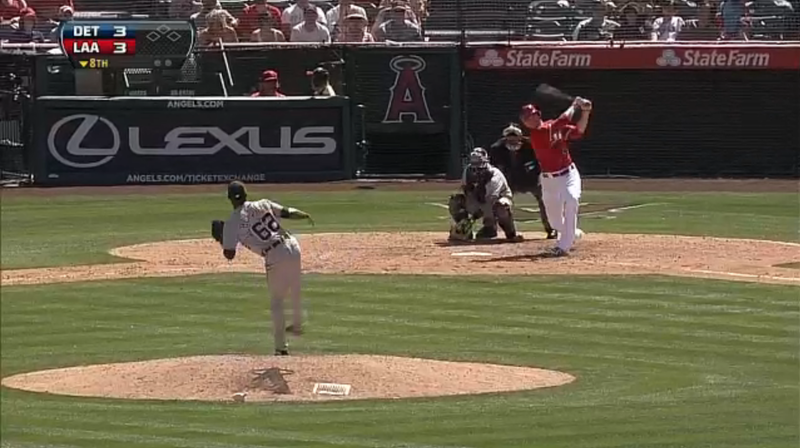 Not surprisingly, Trumbo swung and missed at this slider. (PS: If someone can teach me to make GIFs, that would be super cool). So let’s review. Alburquerque’s slider is very effective and his main fault is being wild. His slider has solid movement and velocity, but the key is that you just can’t see it coming. I can only imagine what it’s like to stand in the batter’s box. The ball comes from behind his head! Two lessons jump out. 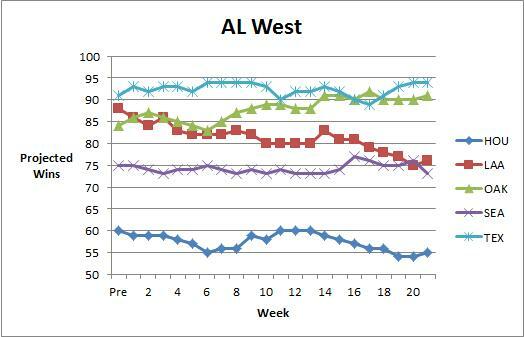 One, if Al-Al finds a way to get down to like, 4 walks per 9, he’ll be the most dominant reliever in the game. Two, his elbow is going to explode at some point. 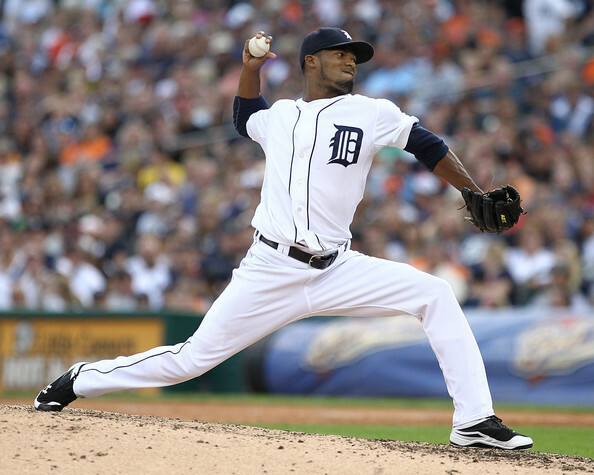 Elbows shouldn’t move like normal pitchers make them move. This movement is just ridiculous. Good luck, people facing him. I would just recommend you look for a walk. Justin Verlander (28 GS, 178.2 IP, 3.73 ERA, 3.54 FIP, 3.7 WAR) had a very bad first inning and while his team recovered very quickly, he would eventually dig the hole too deep. Only 3 of his 5 runs were earned across 5 innings of 3 BB and 3 K baseball, but even allowing three in five innings is too many to average. The bats got him three runs in the 1st thanks to a bases loaded single by Fielder, but they would get no more as the rains came early and often. The game should have been delayed much earlier, but the umpires pushed it to the point of comedy and we ended after 5.5 innings. The Tigers didn’t deserve to win, but it is ridiculous the way the league/umpire attempt to push games past 5 innings in order to make them official, and while doing so, make the games a joke. You shouldn’t play 3 innings in pouring rain. Hopefully Wednesday night will be drier for Doug Fister (26 GS, 167.2 IP, 3.54 ERA, 3.25 FIP, 3.7 WAR) who will try to get the Tigers a win. Sleep it off Detroit. The Moment: Fielder delivers a 2 run single. Anibal Sanchez (23 GS, 144.2 IP, 2.61 ERA, 2.43 FIP, 4.9 WAR) didn’t bring his best tonight, but he kept the Tigers in the game with 5 pedestrian innings of 5 H, 4 R, 3 BB, 6 K baseball against the Oakland A’s. He left the game trailing 4-2 thanks to an Infante HR and watched Cabrera tie it up at 4 with a 2 run opposite field blast in the 5th. 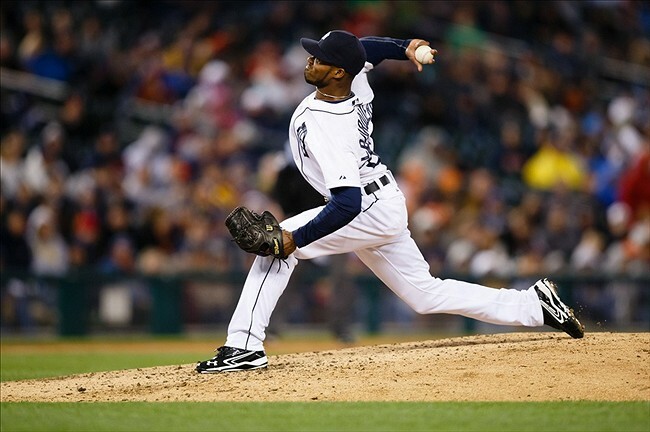 However, the bullpen couldn’t hold it as Alvarez surrendered two and Alburquerque and Bonderman each allowed one. The Tigers had a shot with the bases loaded and two outs in the 7th, but Fielder flew out to deep left center. Martinez crushed one in the 8th to narrow the deficit but Hunter failed to deliver with the bases loaded as the Tigers left them full for a second consecutive inning. They added a run in the 9th but would get no closer. The pitching betrayed the Tigers on this night, even if it did seem like the offense failed to deliver in a couple of big spots. With three more left with the A’s, they will shake it off and call on Justin Verlander (27 GS, 173.2 IP, 3.68 ERA, 3.46 FIP, 3.7 WAR) for game two on Tuesday. The Moment: Cabrera ties it at 4 with a 2 run HR.